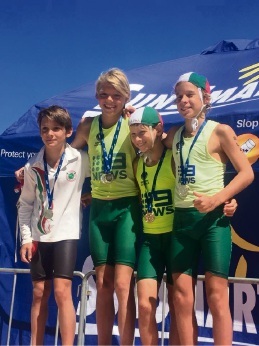 Trigg Island SLSC gold medallists in the under-12 boys beach relay: Fionn Zaffino, Tomas Bosmans, Tristan Heathcote-Mark and Benjamin Toms. JUNIOR members of Trigg Island Surf Life Saving Club have again shown they are the best in the state. The club won the WA Nipper Surf Life Saving Championships for the fourth consecutive year. Nippers competed over three days at Scarborough Beach from March 16 to 18. “Water conditions on Saturday proved challenging across all age groups but thanks to high standard of coaching, education and training being delivered by our volunteers, Trigg juniors shone through with numerous individual and team medals won across both beach and water events,” club marketing director Jackie Eley said. Zachary had a sensational performance at the competition, winning five gold, one silver and one bronze medal.